Have you ever heard of a condensate pump? Most people have not and that can be a problem if you have one and it is not working. I have frequently written about the importance of drain pans under your furnaces or air handler to prevent water from the air conditioner from overflowing and coming through your ceiling. Usually these pans and the air handlers have drain pipes that will empty condensation to the exterior just by gravity. But sometime the air handler is located in a basement or in a place where a straight drain pipe would have to go up hill and simply not work. In this case HVAC men install condensate pumps. A condensate pump is a cool little device about the size of a tall Kleenex box. The condensation that forms in the furnace or the air handler will drain directly into the tank of the pump and when the float switch in the pump senses that the tank is full then it will turn on the pump motor and the collected water will be directed through a small plastic tube to the exterior of the home. Since the water is being pumped under pressure then the tube can go uphill and around any obstacle. Very cool. There are a few downs sides to these pumps and the greatest is that they don’t seem to have a very long life and they conk out. When this happens then the water from the AC will fill the tank in the pump and then overflow causing all sorts of problems like wet ceilings, crawlspaces or basements depending where the pump is located. The designers of the pumps knew that this might happen so they installed an interlock switch which is design to communicate with the air conditioner. If the pump stops working and the water is getting too high then the pump is supposed to signal the air conditioner to not come on until someone comes to fix the issue. 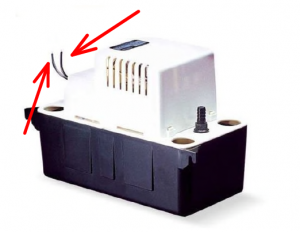 In fact there are two little wires coming out of the top of the pump that are supposed to be connected to the HVAC unit. The problem is that these are often (read that frequently) not connected. When these wires are not connected to the HVAC unit then if the pump begins to fill up too high then the air conditioner will never know and will continue to produce water as usual (up to about 20 gallons per day in some cases). 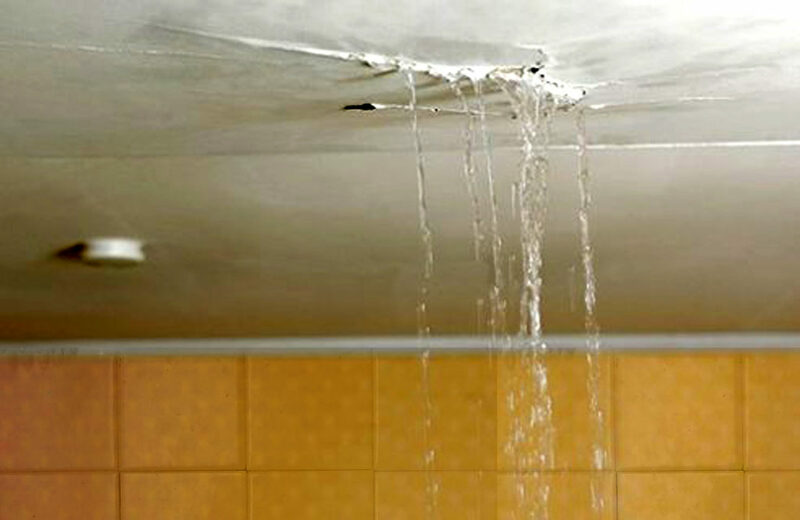 Imagine if four –five gallon buckets of water were dumped on your ceiling…bad news… or if the same amount was constantly emptied into your basements or crawlspace for an entire cooling season. We are talking WET!